Camille Preaker, a reporter for the St. Louis Chronicle, is sent to her rural hometown of Wind Gap by her editor, Curry, to file a story about two missing girls, one of whom was found dead and presumed murdered. Jean-Marc Vallée had a phenomenal success with 2017’s dark, small-town drama, Big Little Lies, based upon the book by Liane Moriarty. It was my favourite series from last year and although they are moving ahead with the second season, Vallée in 2018 moved to direct the eight series run of Sharp Objects at HBO instead. 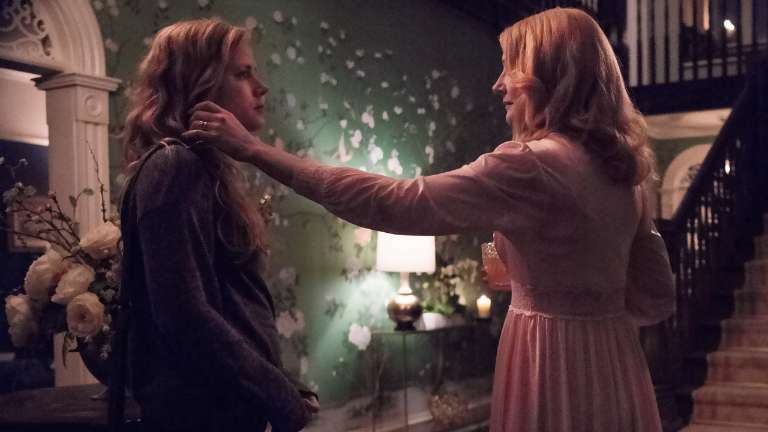 Based on the novel from Gone Girl author Gillian Flynn, it shares some similar territory to Big Little Lies for Vallée -- female lead cast, small-town murder -- but if the premiere episode showed anything, it’s that Sharp Objects is more True Detective than Desperate Housewives. Amy Adams stars as Camille Preaker, a journalist and by all accounts, not the greatest one if we’re trusting the comments from Frank Curry, her editor. Camille appears to have the drive to be good, but she’s also a drunk. Camille has empty Vodka bottles littered throughout her car and her apartment. When Frank tells her she is to go to the rural town of Wind Gap to report on a potential serial killer, she is hesitant to comply. Wind Gap is her hometown and Frank assumes she may have simple family issues there given her push-back to the idea of covering a potentially big story, but tells her she doesn’t really have a choice on the matter. Camille packs everything she needs into a brown-paper-bag, climbs into her unapologetically crappy car and hits the road. The cement landscape fades away and eventually transforms into run-down housing, fields and the open woods of her hometown, Wind Gap. Camille Preaker, like a lot of the characters and story elements in Vanish is introduced with a mystery surrounding her. We get glimpses of her past, as a teenager in Wind Gap where IT actress Sophia Lillis portrays her wonderfully. Something has happened to Camille in her past though, and throughout the episode many possibilities are teased -- none of them good. She is haunted at night as she tries to sleep off the nightmarish visions from her past. The Vodka: self-medication. It’s great to see Amy Adams in this role that is the complete 180 of her DC Universe portrayal of Lois Lane, star reporter. Camille is obviously struggling; something has obviously happened to her to cause her to be how she is and carry the pain she does. Adams portrays this wonderfully, not only portraying the pain she is carrying, but the strength she is using to carry on. The small-town vibe of Wind Gap and the missing girls with murder hanging on everyone's tongues is creepy, but Camille’s Mother, Adora, portrayed by Patricia Clarkson is easily the creepiest thing all episode. From the moment she shows up she is just odd. Her off-putting home with an African-American Butler screamed Get Out to me, but it’s her plucking of eyebrows that gets me the most. I can only assume it’s an anxiety-induced reaction, but on screen, with this performance from Clarkson, it’s nails on a chalkboard for me. Using more subtle story-telling Vallée isn’t afraid to tell a story that requires your attention. Several times throughout the episode a lesser director would have included voice-over, particularly to explain what is happening inside Camille’s head and what she’s thinking. Several drawn out sequences, particularly the car ride to Wind Gap are drawn out using the images on the screen and the music playing in the car as the storytelling mechanism. What’s happening around Camille is important, what’s happening around the town of Wind Gap is just as important and it’s not to say you won’t understand the story without looking at each finer detail, but all these small details are on the screen for you. Sharp Objects is a darkly beautiful drawing that digs its muddy claws into you forcing you to stare and pay attention. One scene in Vanish is particularly hard to watch and by the episodes final moments, we have a gruesome death hanging in the air with nothing but intrigue to carry you until next week. I can't wait until the next episode and if the premiere is anything to judge the season on, prepare for one of the years best new shows.